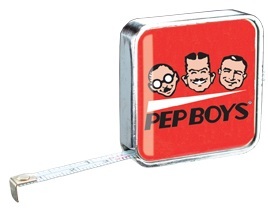 For advertising that measures up, be sure to try our Wholesale Personalized Measuring Tapes. We offer many designs, measuring lengths and sizes. All include your custom imprint and wholesale pricing. Free quotes. Tape measures 60 inches. Available in white, yellow, red, royal blue, translucent red or translucent blue. Imprint area is 1-1/4" diameter. Business Card Small Tape measures 78 inches. Available in white only. Imprint area is 2-3/4" wide x 1-1/2" high. See our low prices. 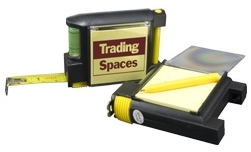 Multi-function tape measure has 10 foot tape measure, level, notepad and pen all in one. Available in black only with one color imprint. Imprint area is 1-1/4" wide x 1-1/4" high. Purchase these with your printed message. 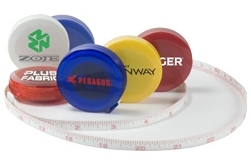 This chrome custom tape measure gives the status of a high quality gift with two-sided full color process domed imprint. Has large imprint area for your printed message. See our impressive price.